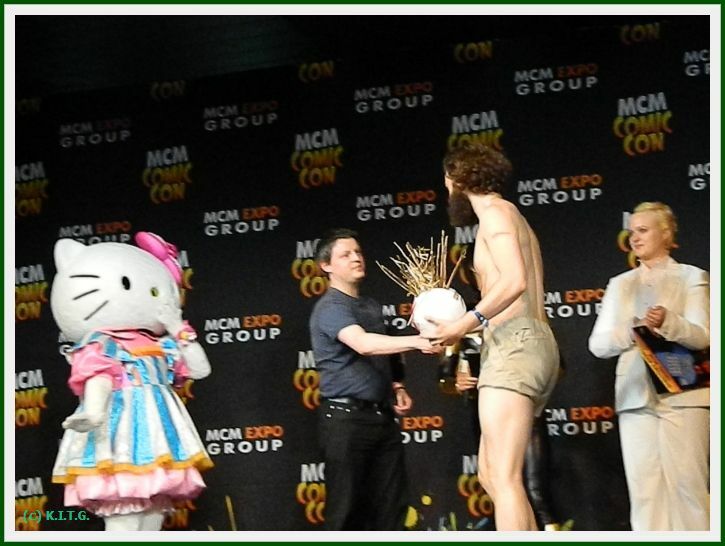 Yes it's that time of year again, the weekend of May 22nd saw the MCM Comic Con return to London for their first two London shows this year. 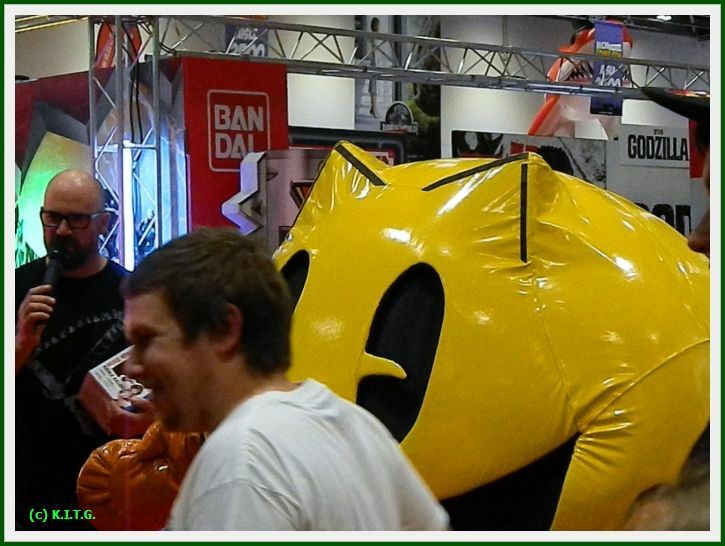 MCM is the UK's premier Comic Con dealing with the latest films and TV , Video games , Comics and of course COSPLAY . The three day event sees a host of stars of the large and small screen attend to promote their latest work and also to meet the fans who in all honesty keep them where they are. 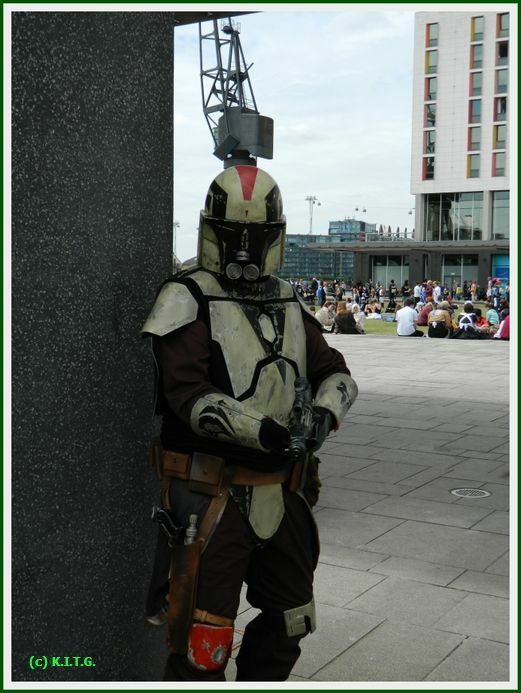 MCM is also the largest event in the UK whose attendees in Cosplay nearly outnumber the regular dressed visitors . 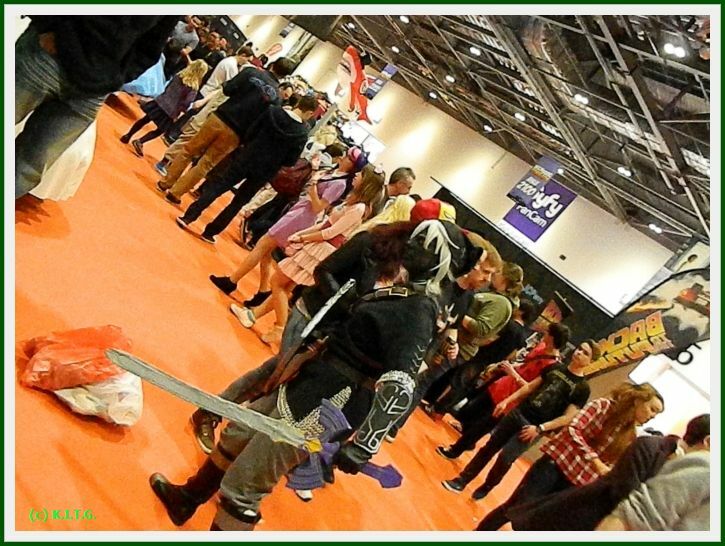 For first timers it can be a daunting experience as you enter the venue to characters from film ,video games ,anime ,Manga and comic books coming to life before your very eyes. 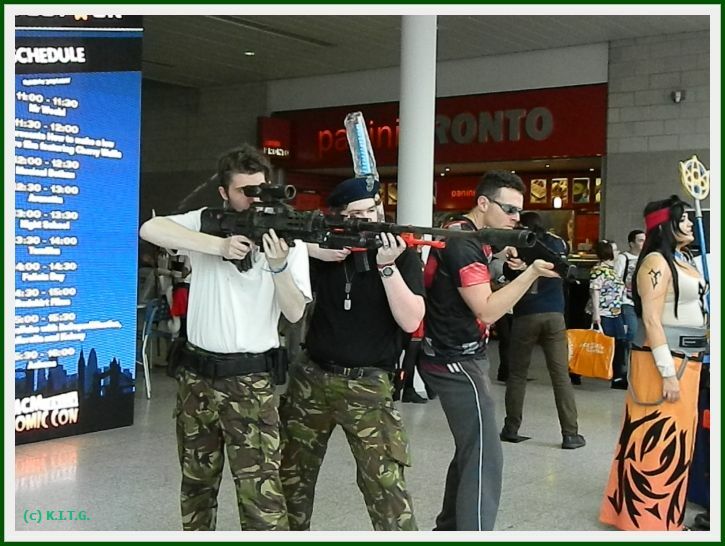 Many of these Cosplayers actually make their own costumes themselves and props and replica weapons from their favourite media . 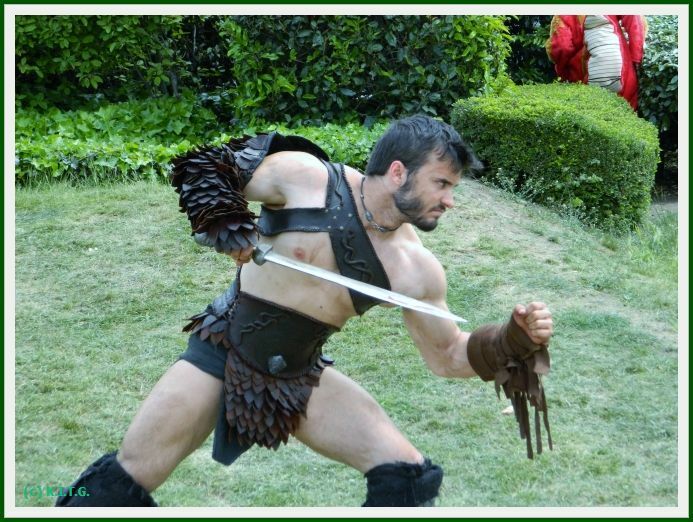 Workmanship in some costumes are just brilliant. 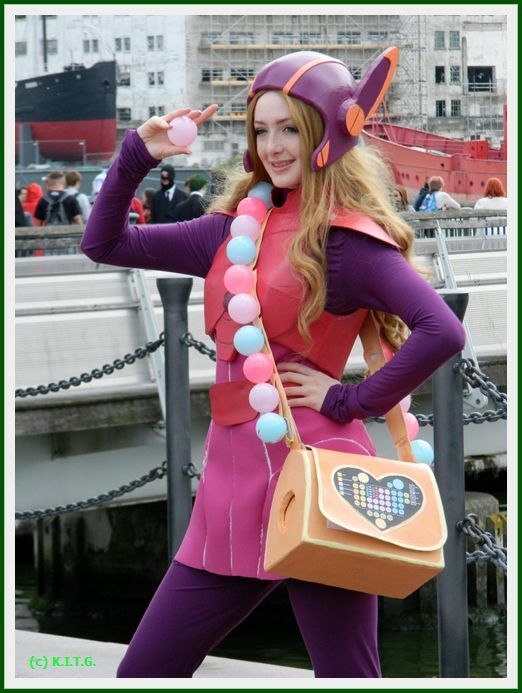 Though there are just as many walking about in manufactured costumes which are readily available on online stores such as ebay and Amazon and specific online sellers of Cosplay costumes. 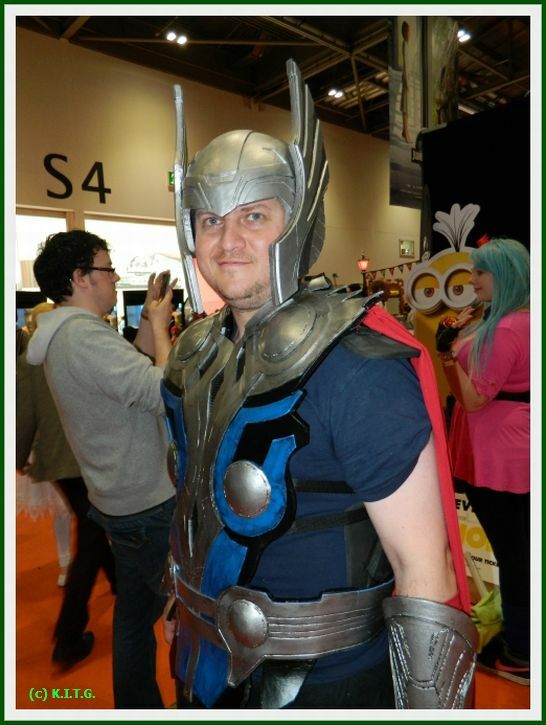 You get your regular visitors dressed as Batman ,Supergirl and other well known super heroes, many of these manufactured costumes fall more into the fancy dress style. 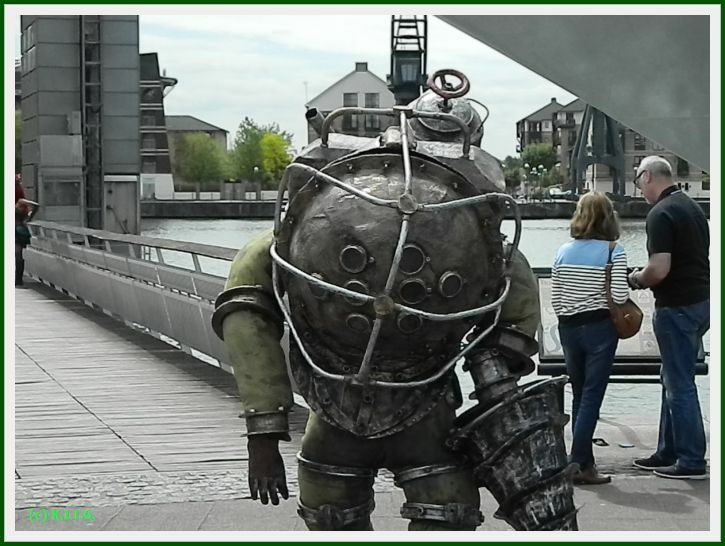 The your find many wearing costumes from Manga or Anime ,these are manufactured as well in some cases ,but tend to cost more to, but as their usually made to measure and made of more quality materials they often look very realistic to their original source material. Yes so first timers will be so in awe of all the costumes and diversity in them that seeing the same costume twice is rarely a occurrence. 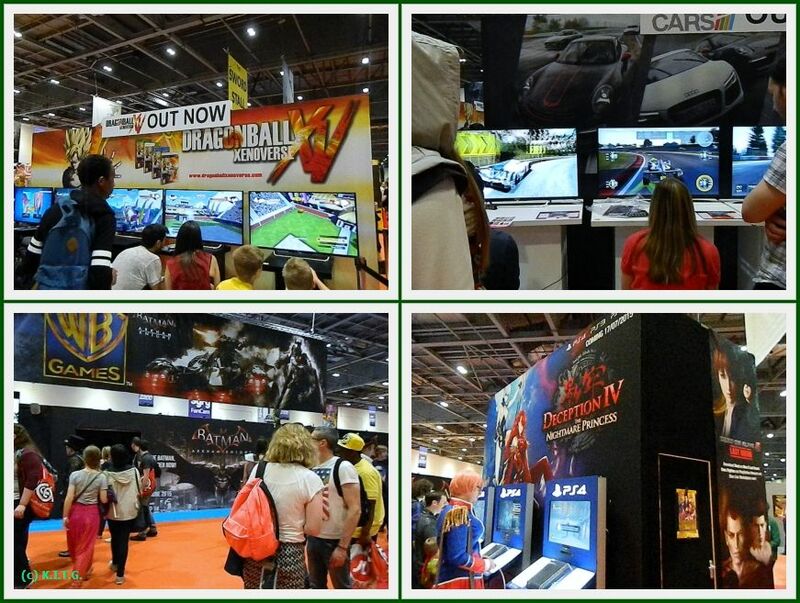 The other showcase for visitors is the video gaming sections where many software houses attend to show of their latest or forthcoming games. 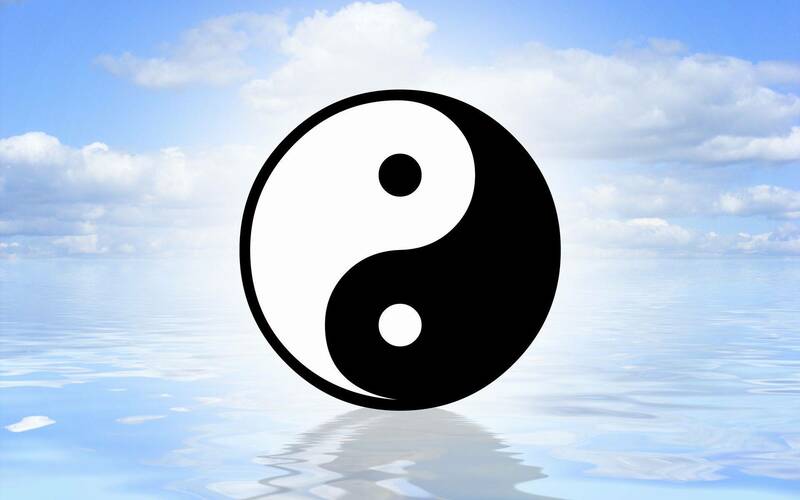 For us that is a section we where there to experience to the fullest . 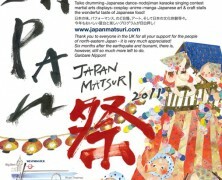 Our preffered day to attend was Sunday ,though I thought Friday might be possible as well but we just could not make it. 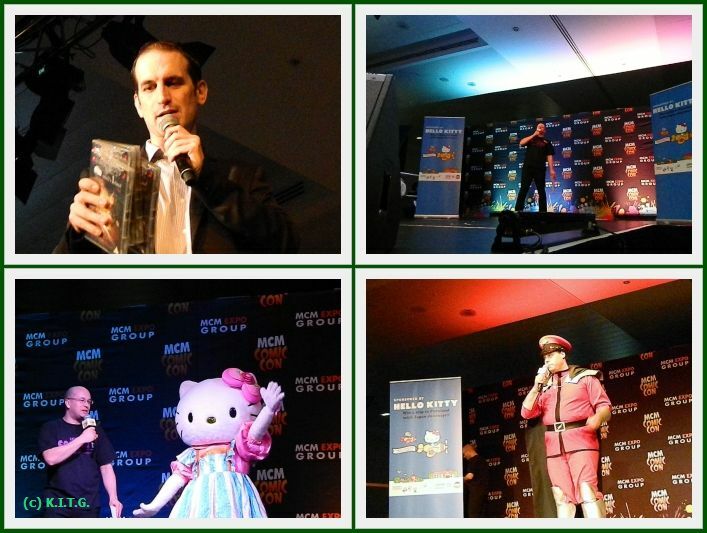 I find that Saturdays are always the busiest at the show and usually only attend those days for a particular panel or interview if there is something happening on the day that we really want to see. 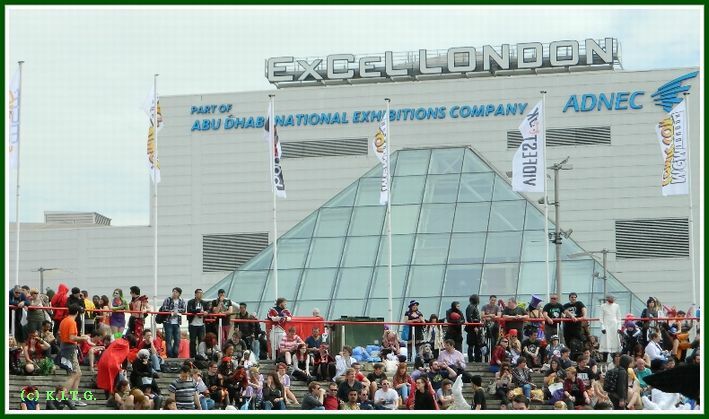 Anyway with a early start we managed to get to the Excel centre in London's Docklands quite painlessly by train. We usually drive but it does cost a lot more to drive and park in the car park then it does to take the train and only adds a half hour to our journey. We new what we wanted to see game wise and headed straight for the halls upon picking up our press pass. First stop the Nintendo stand who we where really glad to see there after their absence at the last October show other then their Pokemon stand. 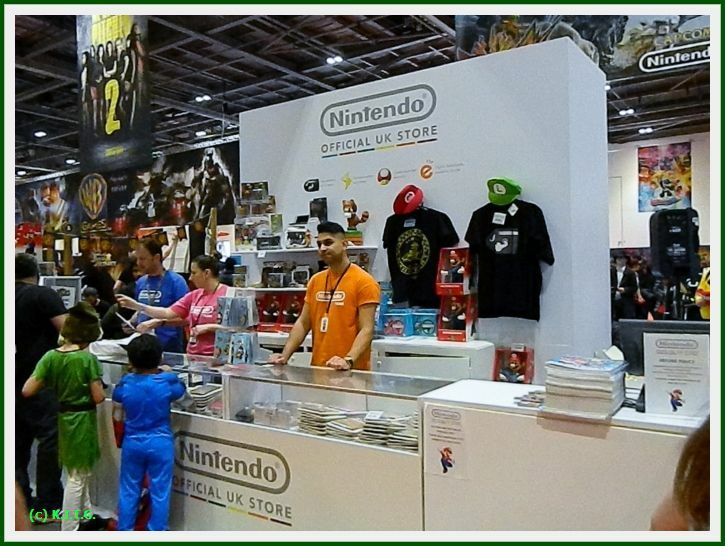 The UK Nintendo store hosted Mario Kart 8 competitions , Smash Brothers competitions and Nintendo's forthcoming eight player four on four online shooter ''SPLATOON' . We had been playing the test fires of Splatoon over the past couple of weeks and new how good the game was. Lucky journalists who are authorised by Nintendo have had a two week solid trial ,but that's something where looking into doing is getting authorised for these bonuses for gaming press, it's a bit harder for us as where not just a dedicated gaming site. Nintendo also had Monster Hunter 4 on 3DS to play as well and Smash Brothers 3DS , which we tried and was happy we did as we got to get hands on with the new 3DS console launched in February this year. Mario Kart 8 was proving popular ,the queues where quite long , but as we have the game we just watched as people battled each other and a a Nintendo representative gave a running commentary like we where listening to the Grand National. 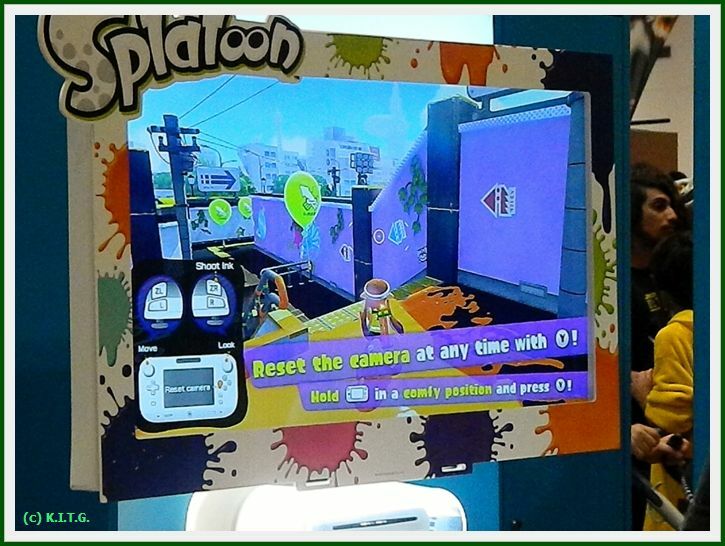 Now we had played Splatoon , the game is Nintendo's al new IP and has been getting some big attention with Nintendo promoting the game with passion for it's world wide release taking place on the 28th and 29th of May 2015. Again queues were long ,but as it was early we thought we would wander and check back later. 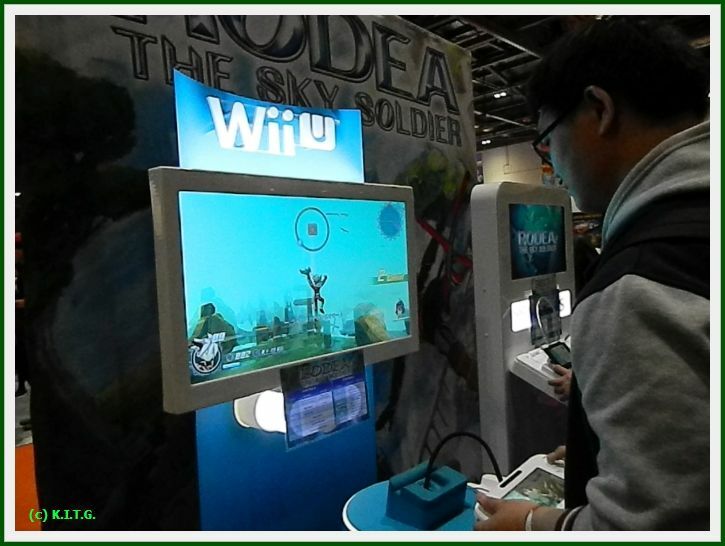 Now another gaming company at MCM was American publishers NIS who are bringing the Kadokawa and Prope game Rodea the Skysoldier to the USA and Europe later this year on both Wii U and 3DS. We where quite excited for this as the game has been in limbo since 2010 /11 . Originally a Wii game by Prope who is owned and run by former Sonic the Hedghog creator Yuji Naka. The Wii game was never released , probably due to the Wii console coming to the end of it's life cycle and Nintendo had already announced the Wii U at E3 2011. Anyway Japanese developers and publishers Kadokawa Games took the approach to reprogram the game for the Nintendo 3DS , this was then ported to the Wii U console upgraded for HD. Released in Japan recently to mixed views as the motion controls for the original game have been taken out due to the 3DS not supporting these controls . But this has upset a few who have purchased the Wii U version who feel the game would be better with motion controls as Yuji Naka designed it that way. But all is not lost as in Japan and as will be in the USA and Europe the Wii U version of the game will be accompanied by the original Wii Game for free in the first print run of the game . So Yuji Naka's original vision will be available to play but of course this is in standard Wii resolution and playable in Wii mode on Wii U.
NIS did not show the Wii version , but we did have a good go on both Wii U and 3DS versions of the game , it may not be a sate of the art looking game but after a while a and some help from another visitor and fellow Miiverser I was able to get a understanding of the game . The game is very reminiscent of Yuji Naka's NIGHTS on Sega Saturn and is one we will be looking into. 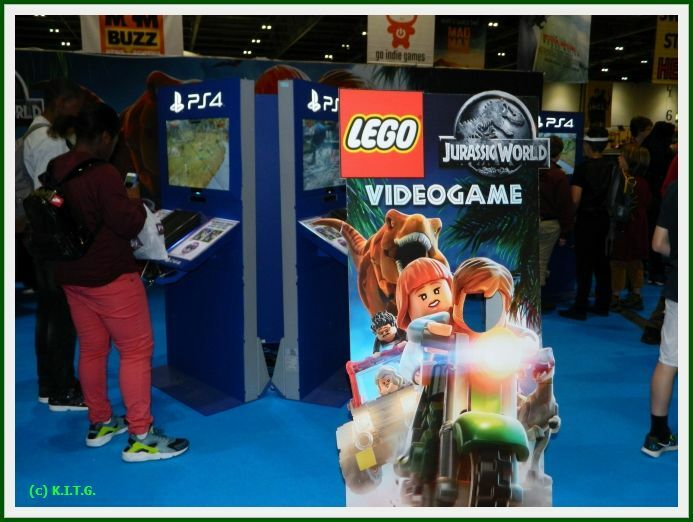 Our next stop was the Game and Warners stand where the new LEGO Jurrasic World was on show , it launches this June on PS4 (version played) ,XBOX One, Wii U ,PS3,Xbox 360 ,Nintendo 3DS and PSVITA. Yes everybody can get to play this latest Lego instalment. Many may think that after so many Lego based games that the format of these games may be wearing thin , but they are solid games which offer fun gameplay . The PS4 version played looked very crisp with nice visuals , the grass looked so real and the movement of the Lego Dinosaurs was magnificent, really smooth. Gameplay is very much like any other Lego game ,but I supposes If it is not broken it does not need fixing. 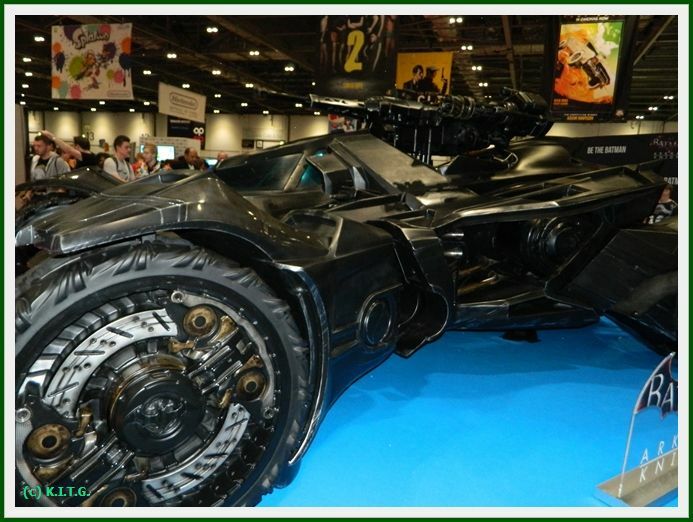 Warner also had a screening of the new Batman Arkham Knight game coming to PS4 ,PC and Xbox One this June . The screening behind closed doors looked very much like the format they had implemented at EGX last year. We had seen that so declined to enter their sweat box again, I'm sure that's where I got my flu bug last year. Between all my wandering around I was taking pictures of the stands and getting some shots of the cosplayers walking around. 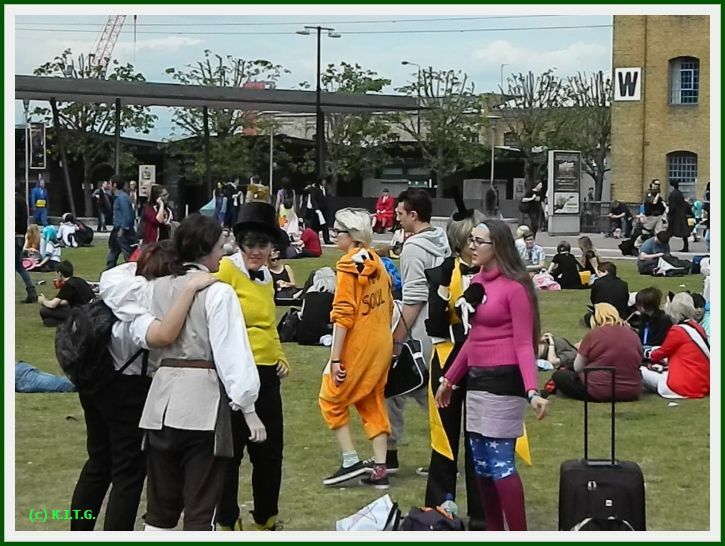 It was a nice day so decided to get outside to see what was going on the MCM fringe stage outside ,plus it was a opportunity to see some great costumes and get some shots. From bands to some very Kawaii dancing to Japanese songs going on outside the venue was as busy as inside. But I was lucky to catch a a group called Paniclab who performed a slice from their stage show R.I.O.T. 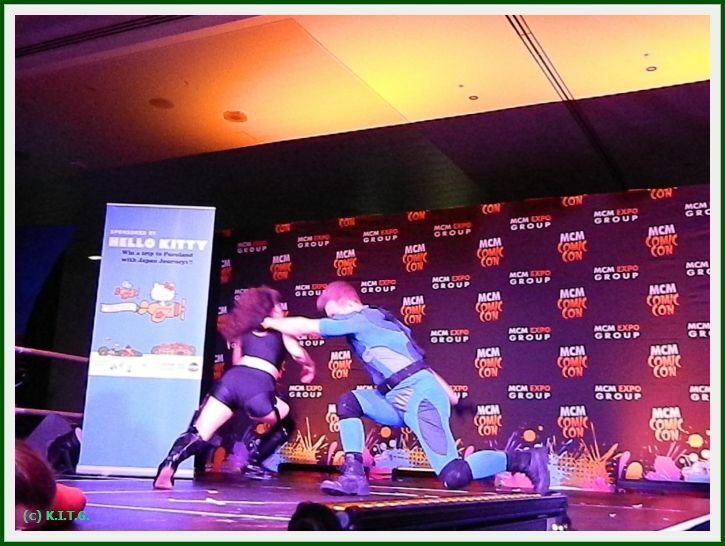 Bringing together dance ,fight choreography all while dressed as characters from comic book heroes to villains. 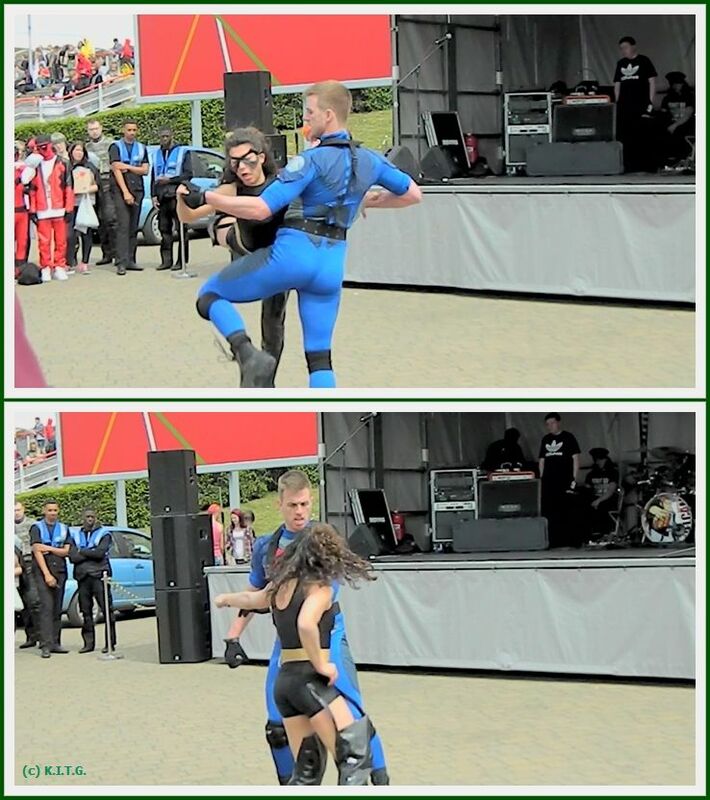 Costume wise they keep it tight and lycra based to allow free movement .Other then some elbow and Knee pads these guys and girls where performing fight action involving not just kicks and punches but throws, flips and rolls and they where doing this on paving slabs. It was definitely something to see. 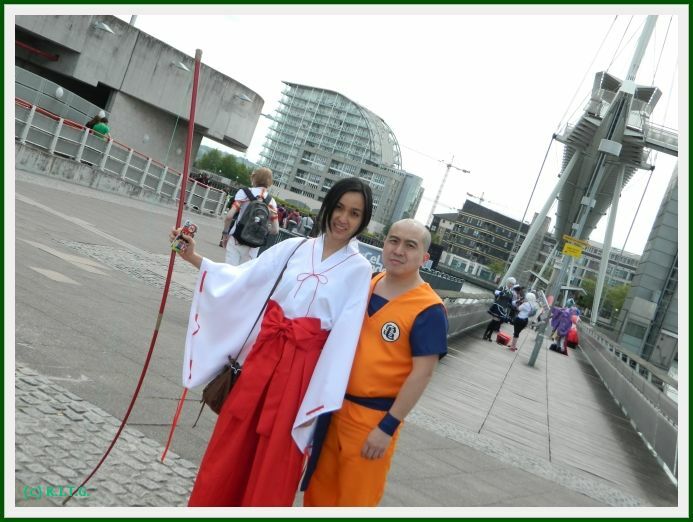 Cosplayers where filling the docklands with colour everywhere , and managed to get some quite good shots of some really cool outfits people where wearing. Whoever was in this outfit must have been so hot! A stroll around the venue revealed a cosplay meet up with various shenanigans going on , one of which involved a lot of push ups in time with a song that they played on their boom-box. The winner was really the last one able to make it to the end, with the Sun beaming down it looked no easy task. Back inside , we ventured around the stalls seeing the wares people where selling, regular sellers where in attendance including Tokyo Toys , Manga UK , Game and many more. Now was the time to join that SPLATOON queue , it was down a little but still about twenty minutes wait , it gave me a chance to see what map was playing and if they where the same as the ones featured on the Test fires. While waiting I was able to get a picture of a young girl in a BAYONETTA outfit playing Splatoon.. 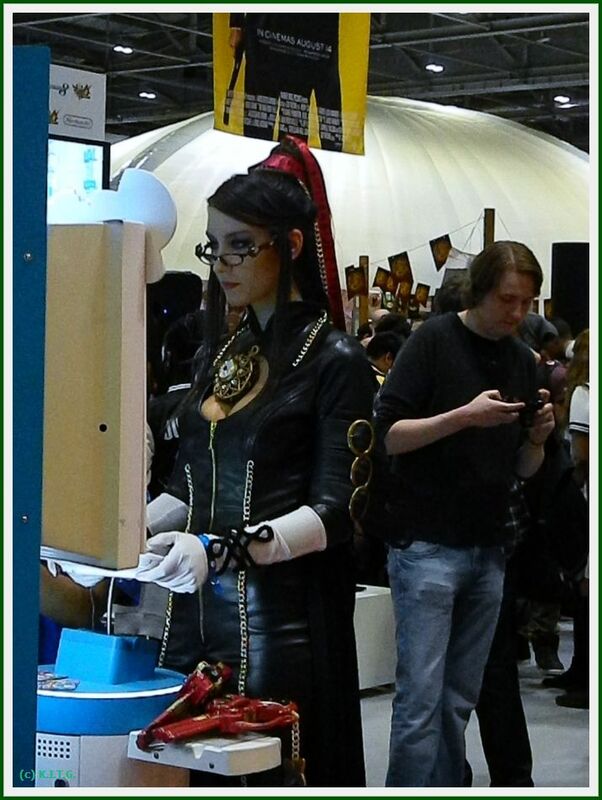 In fact everyone was taking pictures of the Bayonetta Girl playing Splatoon. 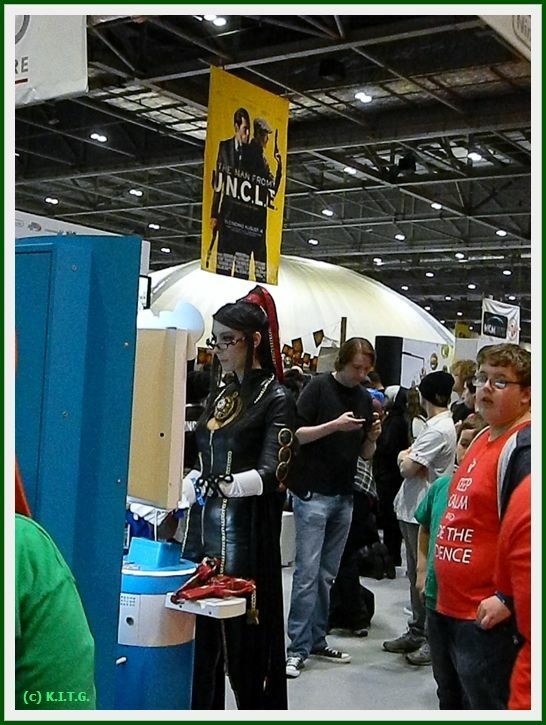 Well men where taking pictures of the Bayonetta Girl playing Splatoon. But It was truly a amazing outfit. Anyway on with Splatoon , I got my match and after being eager to get stuck in I ended up on the opposites sides team , so could not see who I was playing with but could see who I was against. With the Nintendo girl chatting to me while I played , I was amazed I finished on the winning team and king of the hill. I think we actually won our match like 72 to 28 . I had mastered the warping jump and with my Splat Gun I new I was covering the land in Blue..
Splatoon done next was over to the Namco Bandai stand which played host to quite a few games , I got stuck into the PS4 version of One Piece Pirate Warriors 3 , it's a typical entry in the series which offers Musou style game play and any fan of the Dynasty Warriors games would enjoy this. Naruto was another playable game on stand ,but I I have never really got into these games, I watched it but did not play. The new GODZILLA game shown on PS4 and XBOX One looked very dynamic and if your into smashing up cities and fighting dinosaurs then this is not to be missed. I have a tendency to stay away from RPG style games at shows , mainly because you end up getting involved and your there playing the game for ages . 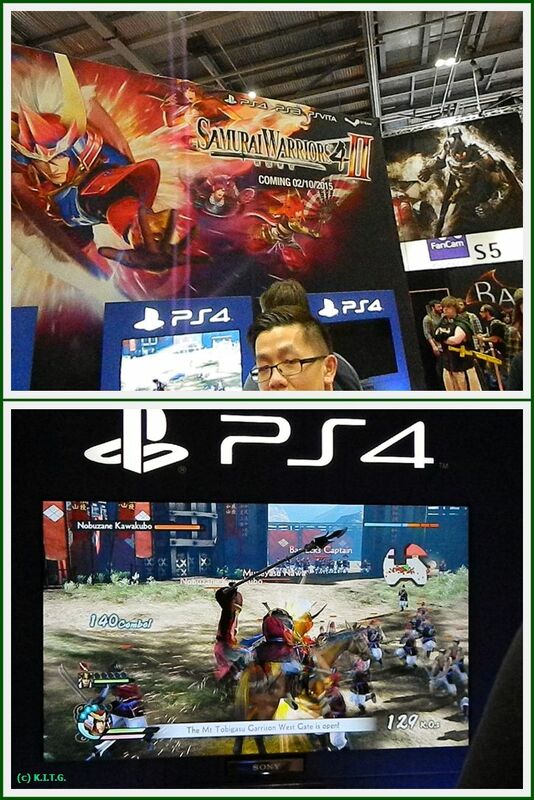 Tecmo Koei demoed another iteration of the Samurai Warriors franchise , again on PS4 , it looked lovely but after playing One Piece I thought it's similar style just with traditional settings. The weekend also played host to stars of TV and film, with Nick Blood from Marvel Agents of Shield and Orphan Blacks Kristian Bruun. Also John Noble who starred in the TV series of Sleepy Hollow was in attendance , he plays Henry Parish in the series. Plus also Shane Ritchie from EastEnders was also there . 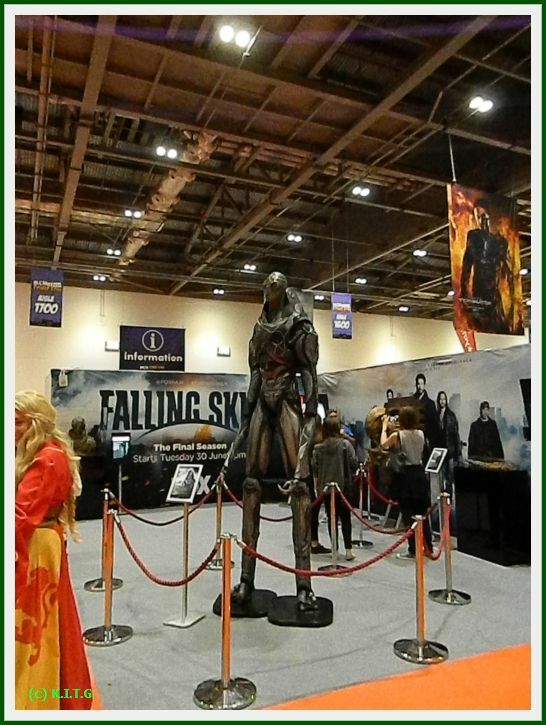 I did walk the star areas briefly but whenever I walked past they seemed empty , I must have just missed them as they venture from the signing tables to panels and photo shoots. But as I have not seen much of the shows their in I really don't know to much about them , and must admit if they walked past me or even said hello I would not know who they where , apart from John Noble , and that's only because I recently watched the first season of Sleepy Hollow. Hopefully by the next show I may have caught up with some newer series and the stars that appear I might actually know and then where go more in-depth and sit in on some panels and if it's someone who we follow more in-depth on site will will arrange a interview. 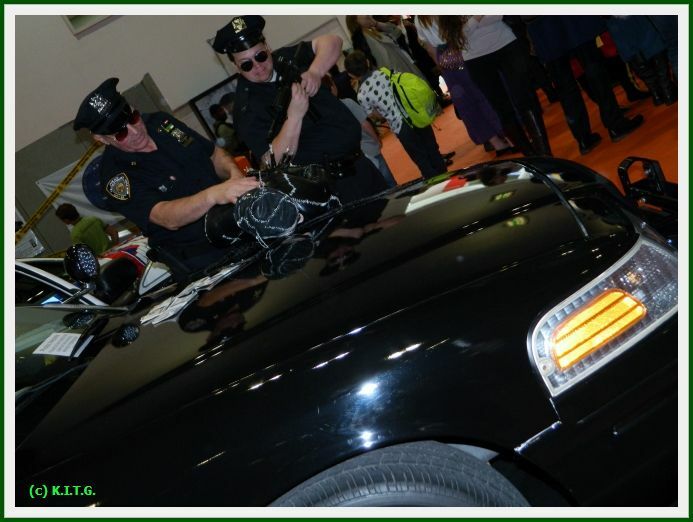 Now I new there was panels on and the upcoming Cosparade for Sunday. 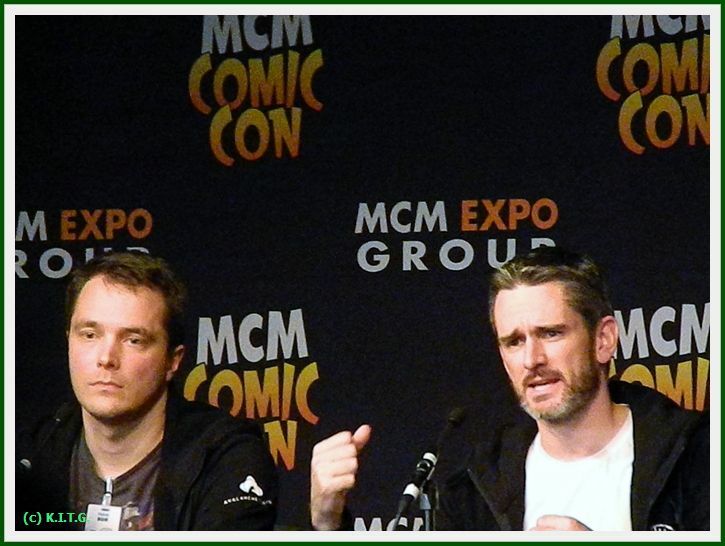 The MCM info desk proved very helpful with times and I went and sat in on the Mad Max game panel featuring members of the development team from Avalanche studios. John Fuller and Andreas Thorsen where on hand to to explain the game and answer questions. This was quite interesting to hear about the game and how there focusing on a single player mode as opposed to another multiplayer online game appearing which would be forgotten. But these are the guys behind the Just Cause series of games and if you have played any of those your know the attention to detail they take in their games. Involving a open world with fighting and driving sections the games comes to PS4,Xbox One and PC in September . 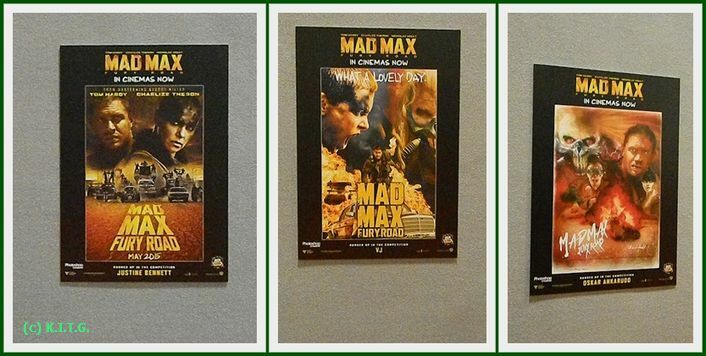 Prior to the panel I had seen the Mad Max poster display of various posters designed by different people , I managed to take shots of these ,some are really clever designs capturing the feel of the original films. 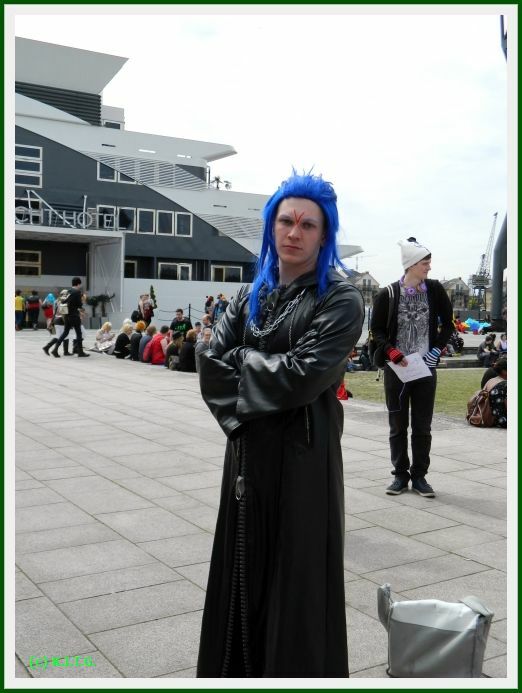 Anyway After the Mad Max talk I stayed put as the cosplay Parade was about to begin . Sponsored by Sanrio and Hello Kitty the Sunday parade was about to begin once some initial set up was finalised , this gave time for our hosts to give away some freebies to the audience courtesy of Tokyo Toys. Sweets ,DVD's and Mystery Boxes where the order of the day. 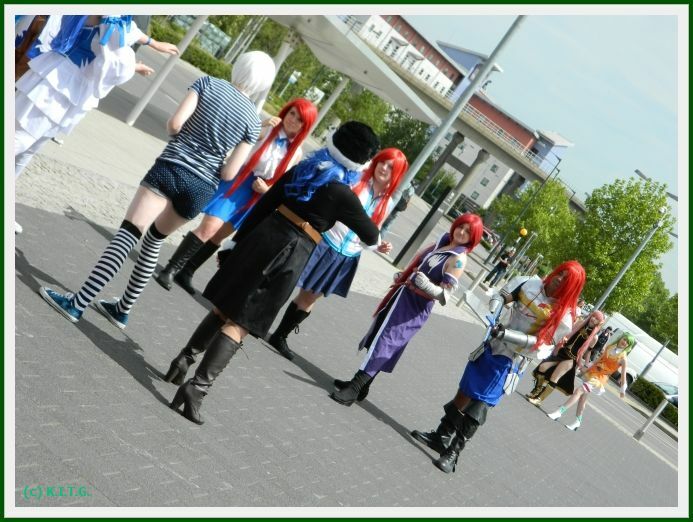 Once again the varied cosplays and skits and performances where pure entertainment . Again from classics like Frozen, Tangled and street fighter , to original ideas and even the film Castaway with Tom Hanks playing host to the cosplays on display. 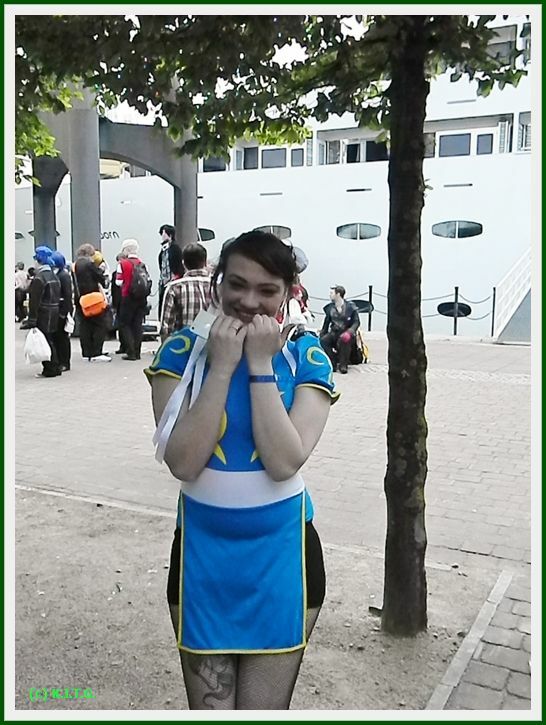 Musical numbers and dance filled the stage as well as a comedic M Bison from Street Fighter getting a double showing after his first appearance ran into technical troubles and he had to blag it. But he done well and came back to re-perform once the hitch had been fixed. 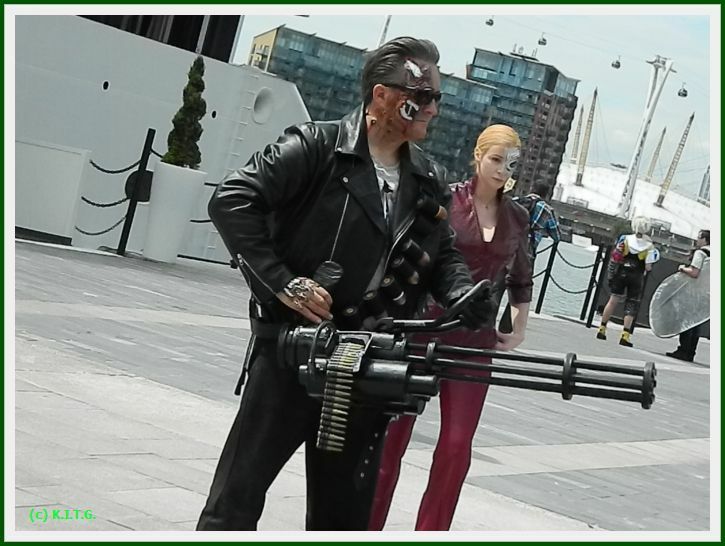 The cosplay Parade was a good length of around a hour and while judges decided the outcome the audience was treated to Paniclab's preview of their R.I.O.T. Show on stage. Which once again impressed me , even though I had just seen it a few hours earlier outside. By the time it was all over and winners announced it was time to go , the day had passed and the hours washed away by surreal world of Comic Con London Style..
We hope that for the October show we can get to do at least two days and maybe three, and maybe even attend the Saturday party . Our thanks go to MCM Group and Gary Burns and Dave Axbey from the Press office for the press pass. 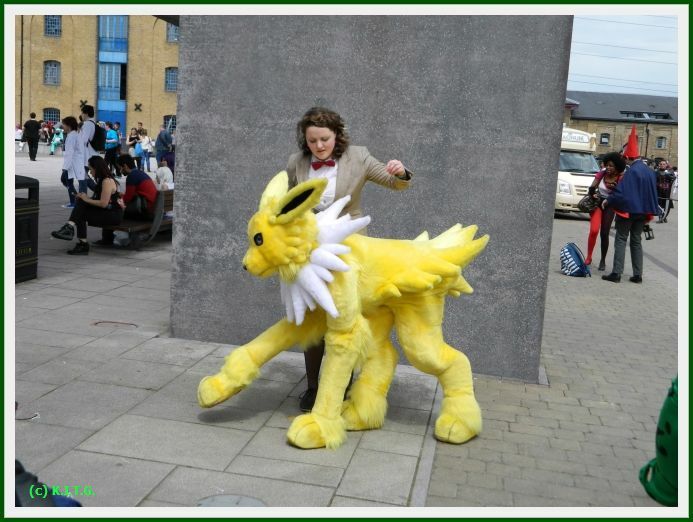 Don't forget to check out our more in-depth look at the cosplay for the show on our sister site Cosplay heroes .Link Below.